Honestly I am always in the search of a "feel good" indie comic. They are so few and far between. This comic is definitely one of my favorites because it's easily relatable to me being about an artist and the struggles finding one's niche. It's well written and has awesome artwork; a powerhouse if you will. I'm excited to see where the rest of the story line takes Molly. GUYS GUYS GUYS GUYS NEW GRAPHIC NOVEL ALERT. Sort of...It's an awesome, cat filled, diverse web comic that will be doing a kickstarter in the future to print this comic. Which will be well worth it because it was a funny, easy and laugh out loud story following Molly. (This is the review for #1-#5)Molly is an artist living with her parents, struggling to get by and spending time with her loveably cat, Pishi. However, her inspiration to of art is kind of lacking. All she can manage is drawings of her kitty and when she posts his photo to her social media, a lady asks for Molly do a drawing of her cat. So Molly takes a trip tot he city, see's her other, great art friends and draws a cat. It was by pure luck that it leads to Molly getting a job cat sitting and doing artwork. (It's the prefect combination if you ask me! )This story goes quickly and you easily fall for the company of Molly and her friends. The show is stolen by the range of cats that take over the comic and trust me, you'll be wishing you could pluck them off the page and cuddle them in your arms. One things I didn't like about the comic though, was Molly. Sometimes she was so whiney and oblivious that it frustrated me but she does redeem herself in her adorkable way. I can't wait to see more of this comic and hopefully, you guys will love it too! Read it! For the cats! Finding Molly: An Adventure in Catsitting is a graphic novel about Molly Sanchez-Talebi, an unemployed art school grad who hesitantly starts catsitting to pay the bills. She dreams of breaking out of suburbia and her artistic rut, but she has a lot of self-discovery to do before that happens. The comic follows her funny misadventures as she learns that maybe these (sometimes) friendly felines are just what she needs to get her life on track.Rating: 4/5 PenguinsQuick Reasons: adorable, GORGEOUS artwork; loved the humor, the snark, and the true-to-life characters; some heavy subjects interlaced with catty mischief; this was such an entertaining, beautiful read!Huge thanks to Justine Prado, Jenn St-Onge, Carey Pietsch, and YA Bound Book Tours for sending me a free digital galley of this title in exchange for an honest review! This in no way altered my read of or opinions on this book.Let me just start by saying: OH MY PENGUINS, THIS ARTWORK! Seriously guys, the art in this graphic novel is so gorgeous and drool-worthy and just... GAAAAAH! I found myself stroking my Fire tablet like a deranged penguin, eyes star-struck and huge, because so many pretties I cannot even! The color choices are gorgeous, the backgrounds are so so well-rendered, and the entire thing is just... THIS. This is what I love about graphic novels--how they can, when done correctly, draw you into the world and refuse to let you leave it. Even now, hours later, the artwork in this book is vibrantly painted across the backs of my eyelids. I will, I fear, be dreaming in these colors tonight. And that is not at all a problem in my world.The panels are also complex and well-done. It's obvious, just glimpsing through this, that the gals who worked on it knew exactly what they were doing and exactly what they were aspiring to accomplish. The flow is smooth and natural, the lettering was chosen well to both work with and stand apart from the rest of the graphics... Every detail was considered carefully, and I so appreciate that in graphic novels. There is also a section in the back that gives readers a glimpse into things like creation process and character drafts--things we don't normally get to see in a comic or graphic novel, that somehow made me love this read even more.But the kicker? These characters. Their personalities are just as vibrant as the artwork, they come to life within these pages, and they handle some pretty big messages about life and living. Their interactions with and reactions to the world around them, and each other, only helped solidify them in my mind--and the artists did a gorgeous job of highlighting the subtle emotions that might otherwise have been missed out on.This was a gorgeously vibrant, entertaining read--filled with CATS! which, I mean, only made it about a thousand times better in my opinion. The artists did an amazing job capturing and bringing these characters to life for me, and I cannot wait to see more from them in the future. I recommend this to lovers of comics/graphic novels, stories about cat sitting gone wrong, and gorgeous artwork. It's time to let the cat out of the bag, penguins--and pick this read up! Molly is an art school graduate with no job and no inspiration, still living at her parents’ house. Her parents are great people, but Molly thought she would have more to draw about than her family’s cat. But then a woman notices her cat drawings and hires her to cat-sit for the weekend, inspiring her to start a web comic about her crazy cat-sitting experiences. Perhaps Molly has more hope for the future than she thought. Finding Molly: An Adventure in Catsitting was an interesting first volume of a comic. The style of art is gorgeous—not elegant, but distinct and shaped to perfectly match the main character and narrator, Molly. Molly and the other characters were memorable and interesting, though some of them could have used a little more development. I was able to relate very well with Molly, which was both good and bad. Finding myself in a similar situation and state of mind that Molly did in the comic, I felt understood. But on the flip-side, I don’t really want to read about how sad someone is. A book, comic, movie, or otherwise is created to bring entertainment, escape, and enlightenment. This story only brought me an hour’s worth of entertainment and maybe a little bit of hope. Still, Molly’s was an interesting story. Those cats were ridiculous, and catsitting them would have been an interesting experience to laugh about later. So I smiled at someone else’s ridiculous troubles. I am curious to know where the writers and illustrators will take the story next. And by, the way, there are a lot of interesting extras at the back of the book, including interviews with the authors.I enjoyed this comic and recommend it to readers who enjoy slices-of-life-types of comics.I received a complimentary copy of this book from the author. All opinions are expressly my own. So book one, right away the art sucked me in. It was super cute, I adored her family cat! He seemed to always be in her way, but he was so adorable and loving. I found Molly as a character to be okay, she seemed to be really struggling with her art. I think she was just making excuses not to paint. I want to publish a book, and I have so many excuses to not write.Sometimes an artist just has to sit down and do a crappy project, just so they can find their mojo.Even a bad painting, or a badly written story is better then not practicing your art! I could relate to her creative block. I also adored her parents they were so sweet.She worked at a bookstore, for free, uhm why? Why would you ever work anywhere FOR FREE? and she hated it. How could you ever hate working at a bookstore?!?!?!?? !Maybe that's when I first began to dislike Molly lol. So far, this is the best graphic novel I’ve ever read. Loved the story, characters, art and colours. I stumbled across this comic by reading a great review of it on IGN. I'm so glad I made my comic store order this for me. It's a crying shame this book is not as popular as other indie comics and, thus, is so hard to find. Finding Molly is the perfect story for any young person chasing down their dream. It's a coming-of-age story that reminds you that you get in life what you put out. And to top it off the art is vibrant and beautiful, and the dialogue and tone is true and relatable; Prado definitely nails that struggling artist vibe. (Trust me--being a struggling artist--I know.) I highly recommend this book for all the dreamers out there. It's not only a fun read, but a breath of fresh air! I loved Molly and her cast of family, friends, and cats when it was a web comic, so much so, that I happily contributed to the Kickstarter campaign to create a published volume.This collection is the perfect fun read for anyone who is brave enough to pursue a career in the arts, for anyone who feels the doubt and frustration in becoming an independent adult, for anyone who plays the comparison game too much when it comes to finding personal satisfaction.And, it's also a fab read for anyone who loves cats. Jenn St-Onge brings these furry little catalysts to life with such charm. I originally only read issue #2 and never got the chance to read the rest of the series. Afterwards I was gifted this graphic novel by one of my friends over the holidays and was super happy to be able to read the entire series. By far my favorite character is Rome haha!Totally worth reading, and I highly recommend! This is one of my favorite graphic novels of all time. In addition to the story, the bonus content was really cool to look at! Definitely appreciated that the artist and publisher added that in there.After finishing the book, I bought one for my niece to help spread the word. I can totally relate to a struggling young artist who finds a voice for herself in LA. This graphic novel is really inspirational and feels empowering to my own endeavors. And the art is so beautifully drawn,I couldn't put it down. This was so cute. I love it. Loved it! I met the author, and she is so nice! I can't wait to buy the sequel! This is a graphic novel about a girl named Molly, who works at a book shop, and feels uninspired and listless. Before, she was an ingenious artist looking to take the art world by storm. And, now…well, now she has her cat.It seems that her cat is involved in every aspect of Molly’s life. He’s just there—always there! What?! What do you want? !To top it all off, Molly has her parents, who explicitly stated, “Listen, either you look for a job today, or you look for a husband.” *Sigh* Why do Mexican fathers feel we should be traded in for beans at the first sign of puberty?“Stuck in the suburbs. Living with my parents. Artistically stagnant. I’m tempted to call this my blue period, but I’m sure there are exciting new lows I’ve yet to reach.”Suddenly, an offer is on the table—someone is willing to pay $200 for a portrait of their cat. Uh, where do I meet you? Sounds pretty good, right? Until the cat basically attacks her. AAAHHHH! Gee, didn’t know the job came with bruises and scratches. Heh….Yeah, cats are not nice. They’re arrogant, prissy, and just plain vicious!It would seem that Molly’s life was going nowhere fast—until one cat portrait turns into catsitting. Oh, the horror! So, deciding to put her BFA from art school to good use, Molly starts drawing comics of her catsitting adventures and posts them on a blog. And what wonderful feedback she receives! Not to mention the mullah from these rich cat owners.The illustrations were awesome and hilarious! Art was so colorful! Facial expressions were so lively and animated. Molly totally rocked! I loved her snarky and candid repartee. She is so funny, down-to-Earth, and relatable. I totally saw myself in her. The artistic block, the desire to create an epic masterpiece, the fear that no one will like your work, the pitiful lack of money, the envy of those more successful than you, and the creative rut you fall into when all else fails—all things I, and so many artists, can relate to. Being of Mexican descent and an artist, I definitely think we need more Latina characters like her in books and comics.FINDING MOLLY is a testament to staying true to yourself and finding your way. It’s a tribute to the art world. Such a fun story! Love, love, loved it! I’ve looked at graphic novels before, but never really sat down and read one. When EMET Comics offered me a review copy of Finding Molly, it looked like something I’d enjoy – bookstore, cats, art, and a young woman struggling post-college to find herself. So although I have no understanding of the genre and no basis for comparison, I gave it a shot, and I’m really glad I did. I read it in nearly one sitting, and then read it again to see all the little things I missed the first time. Molly is out of college, working (for free) at a local bookstore, and living with her parents. She dreams of becoming an artist but has no money, no space to work, and very little motivation. Her friends live in a studio and paint every day, and she envies them. She discovers an unexpected source of income when she posts a picture of her cat to her blog, and a woman offers to pay if she’ll come to her house and draw her cat. This leads to some high-paid catsitting, and a chance to save enough to move in with her friends. Still, Molly struggles with her dependency on her parents, who are supportive but want her to get married and get a job. She struggles with her art and whether she has what it takes. And she struggles with her relationships with her closest friends.There’s an awful lot to like in this book. I loved the vibrancy of the drawings, and I could appreciate their complexity, from the paintings on Molly’s walls to designs on t-shirts. There’s art within art in this book, and artist Jenn St-Onge uses different looks to convey different times and perspectives (for example, sometimes Molly is remembering so the past has to look different from the present). I also appreciated the diversity in this book, including the occasional use of Spanish. I liked the snarky dialogue and the references to different parts of Los Angeles and the use of technology (selfies and texting and even blogging). And the cats were adorable.Molly’s a millennial, and maybe I’m not the target age for this book, but it didn’t matter. She has some growing up to do, but the themes in this book are universal. I really liked her – even though she gets a whole lot of things wrong, she keeps trying.So as I said, I have nothing to compare Finding Molly to, but I liked everything about it and definitely recommend it. Thanks to EMET Comics for providing the review copy and for encouraging this non-graphic novel reader to give it a try. My full review is at http://thebookstop.wordpress.com. Molly is just out of college and trying to find her place in the world. Presently she is living with her parents are she finds a niche for her art. She finds herself creating cat portraits and ends up becoming a cat sitter. She starts saving up and manages to get an apartment in the building with her friends. But Molly is struggling and still having a hard time adjusting.I really liked this book. I LOVE graphic novels and since I am a huge cat fan I just couldn’t say no to this book. Molly wants to be one her own but she is almost too dependent on her parents. I do understand the struggle to move out on your own but Molly seems to expect to find a place right away where she is an artist. I admit that I was a touch irritated with this part. Beyond that, her adventures with the cats was spot on and I loved how she eventually found her place. The artwork was beautiful and I love how vibrant the colors were. It was easy to get drawn into the images and the story. 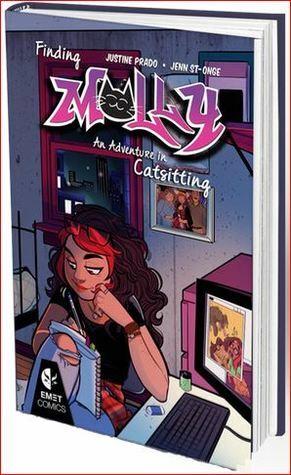 I really loved this book and can’t wait to read more from EMET Comics.I received Finding Molly: An Adventure in Catsitting from EMET Comics for free. This has in no way influenced my opinion of this book. One of the few good things that happened in 2016. Anyone into reading indie comics and empowering women should definitely check out this series. Molly understands the struggles of finding ourselves in everyday life and mixes it in with cats. I mean, what's not to love? This is an adorable coming of age and moving out of your parents' house story. Plus, cats. This is cute. I love the art style and I'm excited to read more eventually. I am not a huge reader of graphic novels, but when the publisher approached me to review, I liked the premise of this story, so I decided to give it a try. On the whole, I'm glad I did. The story is wonderful and very true to life (speaking as a creative myself). It gets across some great messages in a fun and engaging way. The illustrations were great and I thought the story moved at a good pace. The only downside for me was the issue of reading it as an eBook. In print, there'd be no issues, but I struggled reading all the text in such a small space. There was no chance of making it out on my eReader, as I couldn't adjust the page size, so I opened it on the PC instead. Even then I could only go full-screen with the software, no larger, and it was still a bit of a struggle to read the dialogue; I did a great deal of squinting. I got by, but it wasn't entirely comfortable. So if you are planning to give the story a try, I would suggest going with a print copy, or else choose an eBook format in which you know you can really zoom in if need be. I'm not deducting any "points" for this problem, though, so the book still gets a four-star rating.I received this book as a free eBook review copy from the publisher. Finally I get to hold the glossy colorfully amped graphic novel that I first started reading as a web comic! This story of cats, art, and finding independence oddly resonates with me. I love seeing the added 30 pages of bonus concept art and how it all is broken down to create the comic issues. *My only complaint is in the "kitten trio" section (Chapter 2?). This small chunk that was removed was on how Hunter was creating a startup program with an app to "copycat" art. I remember this as Molly takes it as a big affront that he disregards talent for tech in the web comic. The action is slightly mentioned later in the series, but it isn't even first detailed in this printed book edition. Just throwing that oddity out there. Overall I'm excited to see if Molly can rise up and take a more confident hold on her life, career, and passions in later volumes. She certain has got her best foot (or paw) forward at the end. I loved it. As a cat lady and a millenial who had to figure out post undergrad life, I appreciated the Molly's journey to getting herself in the direction she wants to be in. The art and color was also fantastic! I will definitely be checking out more books from EMET Comics. I just LOVE this book.I was never too big into comics, but in recent years started reading more and more graphic novels. This book is genius in that it can appeal to and is appropriate for so many audiences. The characters are well-developed, relate-able and totally fun...the art is FANTASTIC. I've also met the publisher that produced this book (and others) and their mission/values/goals of supporting diversity in comics shines through their stories and their art. LOVE LOVE LOVE this and would unabashedly buy it for anyone as a gift.